Mammalian skin contains a diverse array of structures - such as hair follicles and nerve endings - that exhibit distinctive patterns of spatial organization. Analyzing skin as a flat mount takes advantage of the 2-dimensional geometry of this tissue to produce full-thickness high-resolution images of skin structures. Chang, H., Wang, Y., Wu, H., Nathans, J. Flat Mount Imaging of Mouse Skin and Its Application to the Analysis of Hair Follicle Patterning and Sensory Axon Morphology. J. Vis. Exp. (88), e51749, doi:10.3791/51749 (2014). 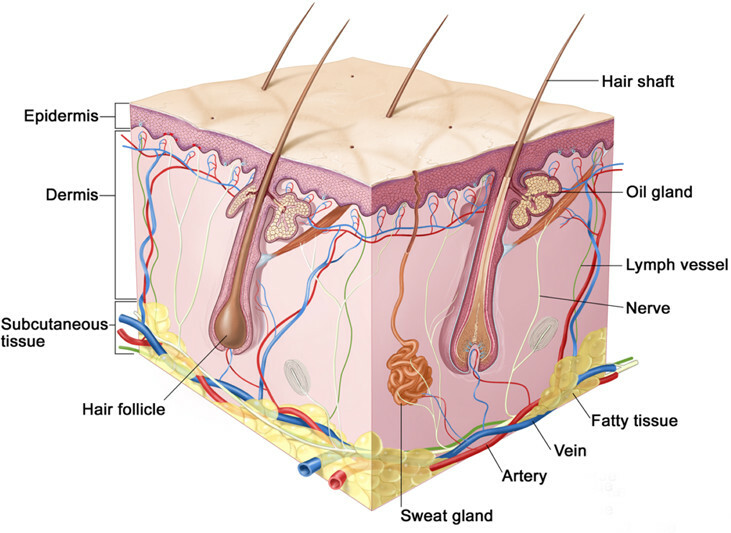 Skin is a highly heterogeneous tissue. Intra-dermal structures include hair follicles, arrector pili muscles, epidermal specializations (such as Merkel cell clusters), sebaceous glands, nerves and nerve endings, and capillaries. The spatial arrangement of these structures is tightly controlled on a microscopic scale - as seen, for example, in the orderly arrangement of cell types within a single hair follicle - and on a macroscopic scale - as seen by the nearly identical orientations of thousands of hair follicles within a local region of skin. Visualizing these structures without physically sectioning the skin is possible because of the 2-dimensional geometry of this organ. In this protocol, we show that mouse skin can be dissected, fixed, permeabilized, stained, and clarified as an intact two dimensional object, a flat mount. The protocol allows for easy visualization of skin structures in their entirety through the full thickness of large areas of skin by optical sectioning and reconstruction. Images of these structures can also be integrated with information about position and orientation relative to the body axes. The skin is one of the largest organs in the body, with important functions in somato-sensation, insulation/thermoregulation, and immune defense1. Understanding the molecular and cellular basis of skin development and function has been of longstanding interest because of the fundamental importance of skin as a biological system and its relevance to dermatology. Mammalian skin contains a variety of multicellular structures, including stratified layers of keratinocytes, dermal connective tissue, several types of hair follicles, sebaceous glands, arrector pili muscles, blood vessels, and at least a dozen distinct classes of afferent (sensory) and efferent nerve fibers (Figure 1). Different regions of the body are associated with characteristically different types of skin. In most mammals, nearly the entire body surface is covered with skin that is densely packed with hair follicles. [Humans and naked mole rats constitute exceptions to this pattern.] Hair is missing from the palmar surfaces of the hands and feet, which are also associated with specialized epidermal patterns (dermatoglyphs), exocrine glands, and sensory nerve endings. The cellular and molecular events that control the growth, differentiation, and spatial arrangement of cells within the hair follicle are of special interest as each follicle exhibits, in miniature, many of the central features of organogenesis2. These features include the existence of stem cells and a stem cell niche, precisely choreographed cell migrations, and the assembly of multicellular structures from embryologically distinct components. This article describes methods for dissecting, fixing, labeling, and imaging mouse skin as an intact two-dimensional sheet, referred to as a “whole mount” or “flat mount” preparation. Since mouse skin is relatively thin, it is possible to image through the full thickness of flattened skin using conventional confocal microscopy. The flat mount approach to imaging mammalian skin is technically advantageous because it bypasses the need for physical sectioning, thereby allowing structures to be reconstructed entirely by optical sectioning. Since nearly the entire skin is processed as a single object, the flat mount approach also facilitates the imaging of multiple regions of the body surface while preserving information about position and orientation relative to the body axes. Finally, structures within the skin are typically present in patterns that are repeated at regular intervals, thus facilitating the collection of images from multiple representatives of a given structure. These characteristics are familiar to neurobiologists who work on the retina, a two-dimensional part of the central nervous system that enjoys analogous advantages for studies of neuronal morphology3. The flat mount approach described here is of special utility for studying structures that exhibit spatial organization on a relatively large scale within the two-dimensional plane of the skin. One example of large-scale spatial organization is the coordinated polarity of hair follicles and hair follicle-associated structures - Merkel cell clusters, arrector pili muscles, sebaceous glands, and nerve endings4. Hair follicles are oriented at an angle with respect to the plane of the skin, and the component of the follicle vector that lies within the 2-dimensional plane of the skin generally exhibits an orientation with respect to the body axes that is precisely determined for each position on the body. For example, hair follicles on the back point from rostral to caudal and hair on the dorsal surface of the feet point from proximal to distal. Hair follicle orientation is controlled by planar cell polarity signaling (PCP; also called tissue polarity5). This signaling system was discovered in Drosophila where a small set of core PCP genes was found to control the orientation of cuticular hairs and bristles. Three mammalian orthologues of core PCP genes - frizzled homolog 6 (Fzd6, also referred to as Fz6), cadherin EGF LAG seven-pass G-type receptor 1 (Celsr1), and vang-like 2 (Vangl2) - play analogous roles in mammalian skin, coordinating the orientations of hair follicles with the body axes. Studies of Fz6 knockout mice (Fzd6tm1Nat, hereafter referred to as Fz6-/-) show that the primary defect in the absence of PCP signaling is an initial randomization or disorganization of hair follicle orientation, with no effect on the intrinsic structure of the follicles6-8. 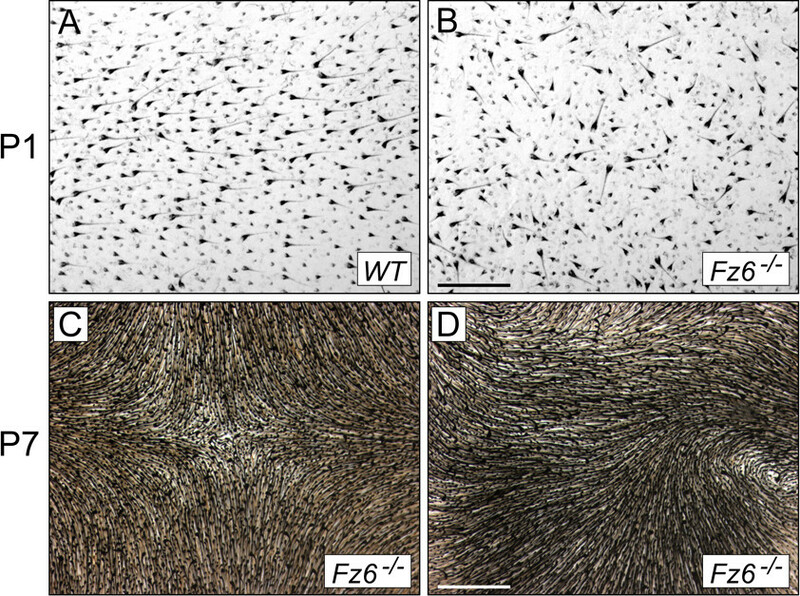 A second non-PCP system acts later to promote local alignment of nearby follicles, which leads to the production of large-scale hair patterns such as whorls and tufts. A second example of large-scale spatial organization within the skin is seen in the morphologies of sensory axon arbors. Sensory neurons that innervate the skin have their cell bodies in the dorsal root and trigeminal ganglia. These neurons detect temperature, pain, itch, and various types of mechanical deformations impinging on the skin and hair9. They can be divided into subtypes based on axon diameter and conduction velocity, terminal nerve ending structure, and the patterns of expression of receptors, channels, and other molecules. Because of the high density of innervation within the skin, analyses that involve visualizing all axons (e.g., anti-neurofilament immunostaining) or even all axons of a single class (as seen when a single cell type is marked by expression of a fluorescent reporter) generally reveals a dense superposition of axons that makes it impossible to define the morphology of an individual arbor. To circumvent this problem, we have used extremely sparse genetically-directed labeling to produce dorsal skin samples in which individual well-isolated axon arbors are visualized by expression of a histochemical reporter, human placental alkaline phosphatase10. This approach allows the unambiguous visualization of individual axon arbor morphologies and a definition of somatosensory neuron types based on morphologic criteria. This study was performed in strict accordance with the recommendations in the Guide for the Care and Use of Laboratory Animals of the National Institutes of Health. All of the animals were handled according to approved institutional animal care and use committee (IACUC) protocol MO11M29 of the Johns Hopkins Medical Institutions. Consult your local Institutional Animal Care and Use Committee guidelines for approved methods of euthanasia. Wear gloves, lab coat, and safety glasses when handling aldehyde fixatives or organic solvents. Follow the manufacturer's instructions, mix the curing agent with the base, and stir with a plastic rod. Pipette ~35 ml liquid Sylgard per 10 cm diameter tissue culture dish. Tissue culture dishes are deeper than the standard bacterial dishes; this provides vertical clearance for the insect pins. Place the dishes on a horizontal surface at room temperature overnight. Bubbles formed during the mixing will disappear. Following polymerization, store the Sylgard plates at room temperature. NOTE: Sylgard plates can be stored at room temperature for years and re-used multiple times until the Sylgard detaches from the plate. Benzyl benzoate and benzyl alcohol (BBBA). Mix 2 volumes benzyl benzoate and 1 volume benzyl alcohol. Store in the dark in a glass bottle with a glass stopper or Teflon top. CAUTION: Used BBBA should be appropriately handled as organic solvent waste. Do not allow BBBA to contact plastic. Phosphate buffered saline (PBS). Add 4 g PFA to 80 ml water, add 0.1 ml 1 N NaOH, stir on a hot plate at ~70 °C for ~5 min until the PFA is completely dissolved, and then add 10 ml 10x PBS and bring the volume to 100 ml with water. CAUTION: Inhalation of formaldehyde/PFA and BBBA vapors should be minimized by keeping these solutions in covered containers. Formaldehyde/PFA is a carcinogen. Oil Red O. Prepare a 0.5% stock in isopropanol. Immediately before use dilute with water to a final concentration of 0.3% Oil Red O, and then filter through a 0.2 µm filter. For very young mice (e.g., fetuses and postnatal day (P)0-P3 pups), euthanize the mice by isoflurane inhalation. Euthanize older mice by isoflurane inhalation or by ketamine/xylazine injection followed by cervical dislocation. Remove the hair with an electric razor and hair removal gel. For mice younger than P8, this step can be skipped. Use a razor blade to make a horizontal cut from the base of the tail along each flank, passing on the dorsal side of the base of each limb, proceeding lateral to the ears and ending at the nose. Gently peel the skin from the underlying tissue proceeding from posterior to anterior by holding the skin between gloved fingers so that it is not pinched by forceps. When peeling the skin at the level of the ears, first cut off the ears with a pair of scissors and proceed especially slowly as the skin can tear at this location. From this point onward, orient the skin with the inside facing up. Pin the skin to Sylgard with ~20 insect pins evenly spaced around the periphery; do not over-stretch the skin (Figure 2B). Cover the skin with 10-20 ml of PBS. Dissect away the skin-associated fat and connective tissue using angled or curved forceps with the pointed end of the forceps facing horizontally to minimize the risk that the forceps will penetrate the skin. Extrude any air bubbles that have been trapped beneath the skin by gently rolling a cotton-tipped applicator over the skin surface. NOTE: If the skin is going to be used for flat mount immunostaining or histochemistry, remove as much of the connective tissue as possible; if the skin is going to be used to visualize hair follicles based on melanin pigmentation, less complete removal of connective tissue is satisfactory. Prenatal skin requires minimal “cleaning” of adherent connective tissue. Fix the pinned skin by adding 20 ml of freshly prepared 4% PFA/PBS or 10% buffered formalin per 10 cm Sylgard plate (if the skin will be used for melanin imaging or alkaline phosphatase (AP) histochemistry) or 20 ml of freshly prepared 2% PFA/PBS (if the skin will be used for immunostaining or visualizing transgenic Keratin (Krt)17-GFP11), and gently rotate overnight in a cold room. The next day, wash in PBS for >10 min. NOTE: Standard formalin is 37% formaldehyde; therefore, “10% formalin” is 3.7% formaldehyde. For AP staining and immunostaining, continue in Section 3. For melanin imaging, dehydrate the skin through a graded ethanol series (70%, 95%, 100%), one day for each step, with gentle horizontal rotation at room temperature. Remove residual connective tissues. With the skin in 100% ethanol, remove the insect pins and, if desired, trim the skin with scissors to remove the most peripheral 1-2 mm of skin with the pin holes. Transfer the skin to a 10 cm diameter glass dish, place two glass microscope slides on the skin to prevent it from curling, and add 20 ml of BBBA. BBBA rapidly hardens tissue so it is important for the skin to be flattened under the weight of the glass slides before adding the BBBA. Over the next several hours, lift the slides off the skin for a few seconds to allow the BBBA to wash over the skin. NOTE: Wear gloves when working with BBBA. Depending on the age and location of the skin there can be as much as 30% shrinkage in BBBA. NOTE: The range of ages typically examined is P1-P8. After euthanasia, cut off the feet above the ankle joint and make a single straight cut along the ventral surface through the soles of the feet. Gently peel the skin from the underlying tissue, proceeding in a proximal to distal direction. Cut the digits to release the skin and pin it to Sylgard with the inside surface facing up (Figure 2C). There is minimal connective tissue on the foot skin. Transgenic Krt17-GFP skin is now ready for imaging. For melanin imaging proceed with fixation, dehydration and BBBA clearing as described in section 2.1. After euthanasia, remove the hair by rubbing hair remover gel over the skin surface with a gloved finger and thumb; wait for 10 min. NOTE: Do not use an electric razor, which will damage the delicate foot skin. Wash the skin surface with tap water, dissect and pin the skin to Sylgard as described in section 2.2. Fix with 1% PFA/PBS for 30 min at room temperature and then wash in PBS. NOTE: For visualizing sebaceous glands on the feet, which develop after the first postnatal week, the optimal age for analysis with Oil Red O is P21, because this marks the nadir of hair pigmentation during the first hair cycle12, and therefore the sebaceous glands can be seen more readily. With albino mice this analysis could be performed at any age. To obtain albino progeny cross pigmented mutant mice to a tyrosinase mutant line such as C57BL/6J-Tyrc-2J . After euthanasia, make a circular cut around the base of the tail, and then a longitudinal slit that runs the length of the tail along its ventral face. Peel off the tail skin starting at the tip by firmly grasping the tip of the tail-bone and/or connective tissue with one pair of forceps and the skin with a second pair of forceps. Pin the tail skin to Sylgard. For the analysis of melanin distribution and hair follicle orientation, fix and process the skin as described in section 2.1. For analysis of sebaceous glands, cut the tail skin into a series of segments ~0.5 to 1 cm in length prior to fixation and incubate the skin pieces in PBS/5 mM EDTA overnight at 37 °C to weaken the dermis-epidermis adhesion13. Gently peel the epidermis from the dermis, pin the epidermis to Sylgard (inner face up), and fix it in 4% PFA/PBS for 1 hr at room temperature. Wash with PBS, and stain with Oil Red O as described below. NOTE: An electric razor and/or hair removal gel can be used prior to dissecting older tail skin (e.g., P21), but this treatment is optional since the hair on the tail is not as dense as elsewhere on the body. After PFA fixation on Sylgard, place fixed skins in a 10 cm glass dish and submerge under PBS/1 mM MgCl2. Gently rotate the dish in a water bath at 70 °C for 90 min to destroy endogenous phosphatase activity. Visualize AP reporter activity histochemically with a 4-48 hr incubation at room temperature in 0.1 M Tris, pH 9.5, 0.1 M NaCl, 50 mM MgCl2, 0.34 µg/ml NBT, and 0.175 µg/ml BCIP, typically using 10-15 ml of staining solution per P21 dorsal skin. Monitor the reaction under the dissecting microscope, taking care not to let it proceed beyond the optimal time, as judged by visual inspection of axon staining intensity relative to nonspecific NBT deposition. Stop the reaction by washing with three changes of PBS/0.1% Tween-20 over the course of 1 hr, re-pin the skins to Sylgard, dehydrate the skins through an ethanol series, and then transfer the skins to a 10 cm dish with BBBA. NOTE: BBBA slowly dissolves the NBT precipitate. During the first few hours in BBBA, a fine background of precipitated NBT will dissolve; as a result, the BBBA solution will darken, and the skin will lighten. Change to fresh BBBA after a few hours. After imaging the AP-stained skin, transfer it to ethanol for >1 hr at room temperature and then store it in fresh ethanol at -20 °C. AP-stained skins can be stored in this way for many months with no loss of signal. Remove insect pins and transfer the lightly fixed foot or tail skins from the Sylgard plate to the wells of a 6-well tissue culture plate, with up to two skin samples per well. Wash with 60:40 isopropanol:water for 5 min at room temperature. Stain in 2 ml 0.3% Oil Red O in 60:40 isopropanol:water (see section 1.2) at room temperature for 2 hr. Wash with 60:40 isopropanol:water for 5 min at room temperature, followed by a water wash. Carefully trim away the edges of the skin, including the pin holes, with fine scissors so that the surface of the skin can be made as flat as possible. Place the skin on a slide with the outer surface facing up, add a few drops of water or aqueous mounting medium, cover the skin with a coverslip, and then gently tape the coverslip to the slide to further flatten the skin. Cut a rectangle of PFA fixed skin (e.g. 1 cm x 0.5 cm), marking its orientation with an asymmetric cut (e.g. clip the anterior right corner). Perform the incubation and wash steps with gentle rotation on a rotating horizontal platform. In the wells of a 6- or 12-well tissue culture plate, wash several times with PBS to remove residual PFA, wash with ~10 changes of PBS with 0.3% Triton X-100 (0.3% PBST) over 5–8 hr at room temperature to permeabilize the skin. Incubate with the primary antibody in 0.3% PBST with 5% goat serum and 20% DMSO for five days at room temperature. Cover the wells of the plate with clear tape or adhesive plastic to eliminate evaporative losses. Wash with 10-15 changes of 0.3% PBST over 5–8 hr and incubate with secondary antibody in 0.3% PBST with 5% goat serum and 20% DMSO for 3 days at room temperature. Wash with 10-15 changes of 0.3% PBST over 5–8 hr. Dehydrate in 25%, 50%, and 75% methanol for 5 min each and then 3x in 100% methanol for 20 min each. Clear in BBBA overnight at room temperature. NOTE: Flat mount immunostaining of skin younger than ~P1 can be performed as described above but with shorter incubation and wash times. For example, P1 skin can be immunostained with an overnight incubation in primary antibody and a several hour incubation in secondary antibody, and with intervening washes of only 2-3 hr in 0.3% PBST. As noted above, younger skins are also sufficiently thin that they can be imaged without BBBA clearing. AMI-43 (green) and AM4-65 (red) are fixable fluorescent dyes that enter cells via non-selective cation channel18. In the living skin these dyes are selectively taken up and concentrated in Merkel cells. Dissolve 1 mg AM1-43 or AM4-65 in 2 ml PBS and store in aliquots at -80 °C. Inject newborn pups subcutaneously with 2-10 µg dye per gram body weight using a 29 G needle. One day later, euthanize the mice and dissect the dorsal skins. Fix the skins in 4% PFA/PBS at 4 °C overnight, wash with PBS, and mount the skin as described in section 3.2. 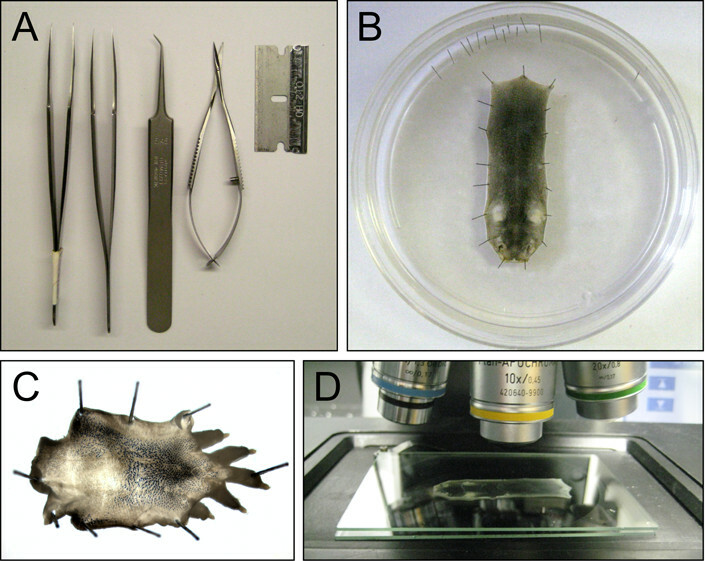 Use a dissecting microscope to image dorsal, foot, or tail skins that are submerged in BBBA, flattened beneath a glass slide, and still in the glass dish - this approach minimizes BBBA contamination of the microscope. Illuminate the dish from below. To minimize spatial variation in light intensity across the field of view, elevate the glass dish to a height ~10 cm above the standard working surface of the dissecting microscope and place a diffusing plastic or glass plate over the light source. Return the skin to 100% ethanol for long-term storage at -20 °C. NOTE: Leaving the skin in BBBA for more than a day causes the melanin granules to break apart. Once the skin has been BBBA treated it will harden and remain flat from that point onward. Different skins can be coded with a series of notches at their anterior and/or posterior ends, so that they can be store together, to save space in the freezer. Place AP stained skin (section 3.1.3) between two glass plates of the type used for small protein gels. Avoid introducing air bubbles between the plates and the skin, and then carefully wick away any excess BBBA with a paper towel. Place the sandwich of plate-skin-plate on a microscope stage (Figure 2D). Use bright-field or DIC illumination with a 10X objective and 2 µm or 5 µm Z-steps. Use a mechanized X-Y stage to capture a montage of X-Y images that are stitched together to create a single three-dimensional grey-scale data set. NOTE: For a single large axon arbor, this data set can be as large as 5 Gb. Perform manual, automated, or semi-automated tracing of axon arbors with any of a variety of Software packages. NOTE: Software such as Neuromantic (http://www.reading.ac.uk/neuromantic/) is a free neuronal reconstruction tool that runs in a PC environment and is relatively easy to master10. Brightfield imaging of skin flatmounts can be used to image cutaneous sensory afferents (Figure 3A10) and hair follicle patterns based on melanin pigmentation (Figure 4). Confocal imaging of skin flatmounts can be used to define the geometry of (1) Merkel cell clusters, visualized with anti-cytokeratin-6 or with AM dye uptake (Figures 3I-L), (2) arrector pili muscles, visualized with anti-smooth muscle actin (Figures 3G,H), (3) sebaceous glands, visualized with Oil Red O (Figures 3C-F), and (4) hair follicles, visualized with a Krt17-GFP transgene or by staining with anti-Krt17 antibodies4 (Figures 3E-G,K,L). It is straightforward to manually score the orientations and spatial arrangements of structures in such images by placing vectors of known orientation on the structures using Adobe Photoshop or Illustrator, and then quantifying the resulting vector populations. While this approach suffices for a scale of several hundred vectors, it would be prohibitively tedious on a 10- or 100-fold larger scale. Figure 2. Skin dissection and sample handling. A) Dissection tools. B) A P5 dorsal skin pinned to a Sylgard plate. C) A P5 dorsal hind foot skin pinned to a Sylgard plate. D) A dorsal skin mounted between 2 glass gel plates for imaging with a 10X objective and DIC or brightfield illumination. Figure 3. Skin structures in flat mount views. A,B) A single cutaneous sensory arbor (left) and its traced image (right) from a P21 dorsal skin of a Brn3aCKOAP/+;NFL-CreER/+ mouse exposed to low dose tamoxifen at gestational day 17. This protocol results in Cre-mediated recombination of the reporter in a very small fraction of dorsal root ganglion neurons, and therefore a small fraction of cutaneous sensory arbors are labeled with the human placental alkaline phosphatase (AP) reporter. The labeled axons are visualized with NBT/BCIP histochemistry. Brn3a is equivalently referred to as Pou4f1. C,D) Tail skin stained with Oil Red O to visualize sebaceous glands from WT (left) andFz6-/- (right) mice at P21. The Fz6-/- structures are disorganized. P, proximal; D, distal. E,F) Dorsal foot skin from WT (left) and Fz6-/- (right) mice carrying Krt17-GFP. The skin was harvested at P21 and stained with Oil Red O. The Fz6-/- skin has a hair whorl in its center. P, proximal; D, distal. G,H) Dorsal skin from a WT mouse at P21 showing hair follicles (visualized with a Krt17-GFP transgene and anti-GFP immunostaining; panel G) and arrector pili muscles [visualized with anti-smooth muscle actin (SMA) immunostaining; panel H]. Depth within the confocal Z-stack image is color coded. A, anterior; P, posterior. I-L) A Merkel cell cluster (visualized with cytokeratin8 immunostaining or AM11-43 dye uptake) and its central hair follicle (visualized in panels K and L with Krt17-GFP). Images were obtained from P1 dorsal skin from the indicated genotypes. The Fz6-/- Merkel cell cluster forms a closed circle, whereas the WT Merkel cell cluster is open toward the anterior. A, anterior; P, posterior. Scale bars: A and B, 300 µm; C and D, 500 µm; E and F, 500 µm; G and H, 200 µm; I-L, 50 µm. (Panels A and B are reproduced from eLife and Proc. Natl. Acad. Sci. USA, with permission4,10) Please click here to view a larger version of this figure. Figure 4. Hair and hair follicles in dorsal skin at P1 and P7 visualized with melanin pigmentation. A,B) P1 skin from WT and Fz6-/- mice. C,D) P7 skin from Fz6-/- mice. Scale bars: A and B, 500 µm; C and D, 1 mm. Mastery of the dissection methods described above requires only patience, a steady hand, and a few good dissection tools. The dorsal skin dissection is relatively easy, but the tail and foot skin dissections – especially at early postnatal ages – are more challenging. At early prenatal ages (e.g., before E15), the skin is difficult to remove without tearing it. Conveniently, for many studies of growth and patterning of skin structures in mice, the events of interest occur postnatally, as seen for example in studies of the growth of arrector pili muscles19. Imaging deep into the skin in a flat mount configuration is challenging because skin is a relatively refractile tissue. This challenge becomes greater as the skin matures due to the differentiation and increased thickness of its constituent layers. One partial solution to this problem is to separate the dermis and the epidermis and analyze the epidermis as a separate structure (“epidermal whole mounts”). This approach is useful for visualizing hair follicles and their associated structures, especially for mouse tail skin. However, obtaining high-quality epidermal whole mounts from mouse dorsal skin is difficult, presumably due to (1) the high density of hair follicles that extend deep into the dermis and (2) the thinness of the interfollicular epidermis13. In our experience, BBBA treatment is a highly effective method for rendering skin optically transparent while preserving immunofluorescent signals without the need of separating the epidermal and dermal layers. Benzyl-benzoate has been used to clear tissues for decades20 and it is widely used to clear frog and fish embryos. However, BBBA has the disadvantage that it denatures GFP and other fluorescent proteins, it dissolves Oil Red O, and it can contaminate equipment (e.g., microscopes). It would be of interest to systematically compare BBBA treatment of skin with other clarification methods such as SeeDB21, ClearT22, Scale23, 3DISCO24, and CLARITY25, some of which are compatible with fluorescent proteins. If BBBA treated samples are to be imaged using a dissecting microscope, a conventional light/fluorescent microscope, or a confocal microscope, the samples should be placed in a glass dish or between two large glass plates to minimize BBBA contamination. We have not discussed data analysis in any detail, as this is more idiosyncratic to the biological question under investigation. However, as noted in the Introduction, the presence of many nearly identical structures such as hair follicles, Merkel cell clusters, and nerve endings, and the completeness with which these structures can be imaged in flat mounts provides an opportunity to measure structural or morphologic parameters in a statistically rigorous manner, as seen for example in recent studies of cutaneous sensory axon morphologies10 and of hair follicles and follicle-associated structures in wild type and Fz6 mutant mice4,8. With the development of more sophisticated image analysis tools, it may be possible to automate or semi-automate some of the analyses that, at present, are performed manually, thereby facilitating wider use of skin flat mount imaging as a method for investigating the principles underlying multicellular organization. The authors thank Dr. Amir Rattner for helpful comments on the manuscript. Supported by the Howard Hughes Medical Institute. Rook's Textbook of Dermatology. 8th ed. Burns, T., Breathnach, S., Cox, N., Griffiths, C. Wiley Blackwell. (2010). Lee, J., Tumbar, T. Hairy tale of signaling in hair follicle development and cycling. Semin. Cell Dev. Biol. 23, 906-916 (2012). Masland, R. H. The neuronal organization of the retina. Neuron. 76, 266-280 (2012). Chang, H., Nathans, J. Responses of hair follicle-associated structures to loss of planar cell polarity signaling. Proc. Natl. Acad. Sci. USA. 110, (2013). Wallingford, J. B. Planar cell polarity and the developmental control of cell behavior in vertebrate embryos. Annu. Rev. Cell Dev. Biol. 28, 627-653 (2012). Guo, N., Hawkins, C., Nathans, J. Frizzled6 controls hair patterning in mice. Proc. Natl. Acad. Sci. USA. 101, 9277-9281 (2004). Wang, Y., Badea, T., Nathans, J. 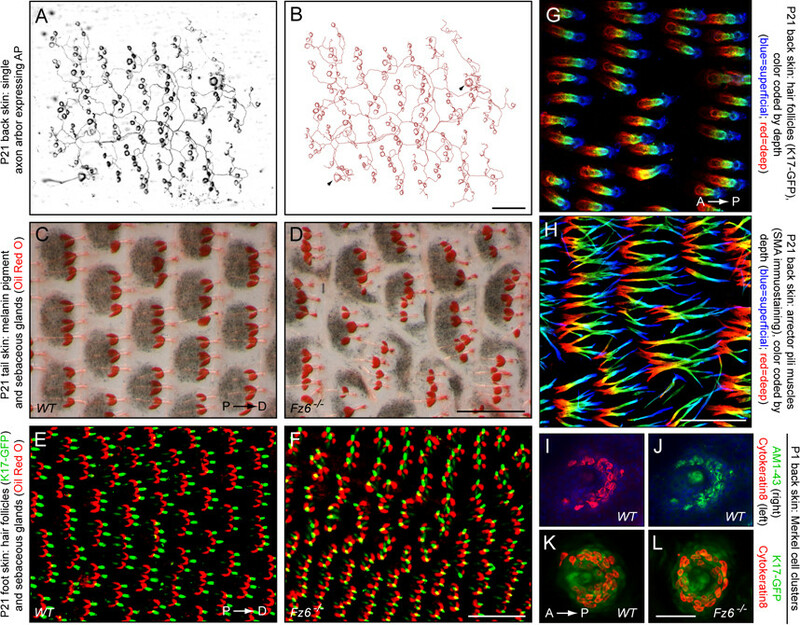 Order from disorder: Self-organization in mammalian hair patterning. Proc. Natl. Acad. Sci. USA. 103, 19800-19805 (2006). Wang, Y., Chang, H., Nathans, J. When whorls collide: the development of hair patterns in frizzled 6 mutant mice. Development. 137, 4091-4099 (2010). Lumpkin, E. A., Caterina, M. J. Mechanisms of sensory transduction in the skin. Nature. 445, 858-865 (2007). Wu, H., Williams, J., Nathans, J. Morphologic diversity of cutaneous sensory afferents revealed by genetically directed sparse labeling. Elife. 1, (2012). Bianchi, N., Depianto, D., McGowan, K., Gu, C., Coulombe, P. A. Exploiting the keratin 17 gene promoter to visualize live cells in epithelial appendages of mice. Mol. Cell. Biol. 25, 7249-7259 (2005). Alonso, L., Fuchs, E. The hair cycle. J. Cell Sci. 119, 391-393 (2006). Braun, K. M., Niemann, C., Jensen, U. B., Sundberg, J. P., Silva-Vargas, V., Watt, F. M. Manipulation of stem cell proliferation and lineage commitment: visualisation of label-retaining cells in wholemounts of mouse epidermis. Development. 30, 5241-5255 (2003). Badea, T. C., Wang, Y., Nathans, J. A noninvasive genetic/pharmacologic strategy for visualizing cell morphology and clonal relationships in the mouse. J. Neurosci. 23, 2314-2322 (2003). Rotolo, T., Smallwood, P. M., Williams, J., Nathans, J. Genetically-directed, cell type-specific sparse labeling for the analysis of neuronal morphology. PLoS One. 3, (2008). Devenport, D., Fuchs, E. Planar polarization in embryonic epidermis orchestrates global asymmetric morphogenesis of hair follicles. Nat. Cell Biol. 10, 1257-1268 (2008). Li, L., et al. The functional organization of cutaneous low-threshold mechanosensory neurons. Cell. 147, 1615-1627 (2011). Meyers, J. R., et al. Lighting up the senses: FM1-43 loading of sensory cells through nonselective ion channels. J. Neurosci. 23, 4054-4065 (2003). Fujiwara, H., et al. 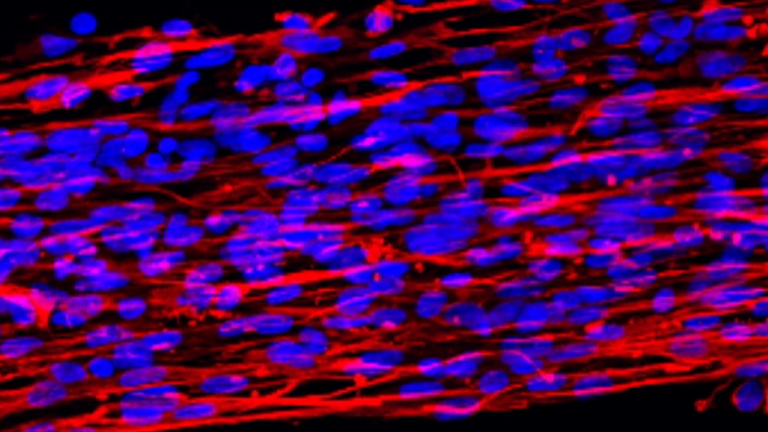 The basement membrane of hair follicle stem cells is a muscle cell niche. Cell. 144, 577-589 (2011). Orsini, M. W. Technique of preparation, study and photography of benzyl-benzoate cleared material for embryological studies. J. Reprod. Fertil. 3, 283-287 (1962). Ke, M. T., Fujimoto, S., Imai, T. SeeDB: a simple and morphology-preserving optical clearing agent for neuronal circuit reconstruction. Nat. Neurosci. 16, 1154-1161 (2013). Kuwajima, T., Sitko, A. A., Bhansali, P., Jurgens, C., Guido, W., Mason, C. ClearT: a detergent- and solvent-free clearing method for neuronal and non-neuronal tissue. Development. 140, 1364-1368 (2013). Hama, H., et al. Scale: a chemical approach for fluorescence imaging and reconstruction of transparent mouse brain. Nat. Neurosci. 14, 1481-1488 (2011). Aal Ertürk,, et al. Three-dimensional imaging of solvent-cleared organs using 3DISCO. Nat. Protoc. 7, 1983-1995 (2012). Chung, K., Deisseroth, K. CLARITY for mapping the nervous system. Nat. Methods. 10, 508-513 (2013).